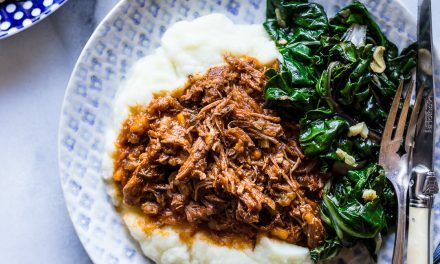 This recipe is sponsored by Good Food for Good. All opinions, thoughts and ideas expressed are the author’s alone. 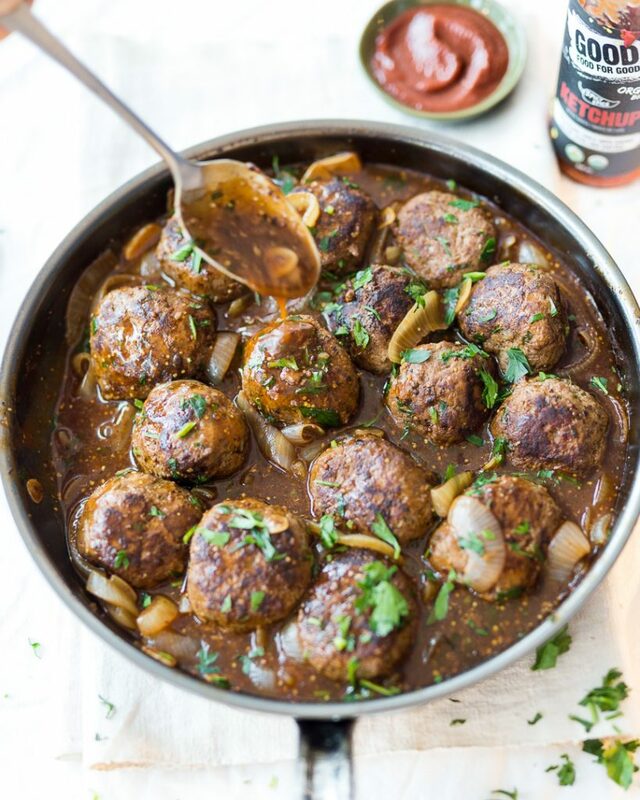 Whole30 Salisbury Meatballs with Onion Gravy just might be my new obsession. 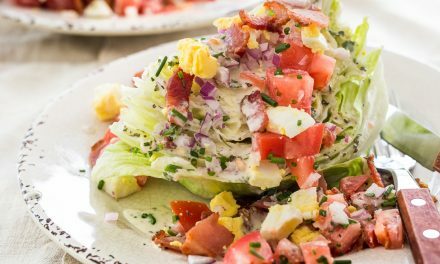 They’re easy to make, bursting with flavour and can be prepared in advance. I’ve made them a handful of times over the past week and can confirm they get better and better! The secret weapon here is the addition of Good Food for Good Spicy Ketchup in both the meat mixture AND the gravy. I can’t stress that enough. The spicy ketchup adds tang, a bit of heat and lots of rich, umami flavour. I was very happy when the founder of Good Food for Good reached out to me and asked if I was interested in trying their product. First and foremost, they’re a local, Toronto-based, small business that makes delicious, high-quality, Whole30 Approved sauces. In fact, they’re one of the very few Canadian Whole30 Approved partners! Their sauces are available at a wide variety of retailers across Canada and a few select stores in America. To find the closest retailer near you, visit their store locator here. Their Ketchups are delicious, handmade with 100% Organic ingredients and are sweetened only with dates. For more nutritional information on their ketchups, visit goodfoodforgood.ca. Good Food for Good is also a B-Certified Corporation and is committed to charitable causes. With every purchase of a Good Food for Good product, the company feeds a child in need, which makes it easy to do good for both your family and others. The Salisbury Meatballs mixture can be prepared ahead of time and frozen before or after browning. You don’t necessarily have to shape the meatball mixture before freezing, but if you do make sure to lay the meatballs flat so that they maintain their individual shapes, otherwise the meatballs will stick together and clump. 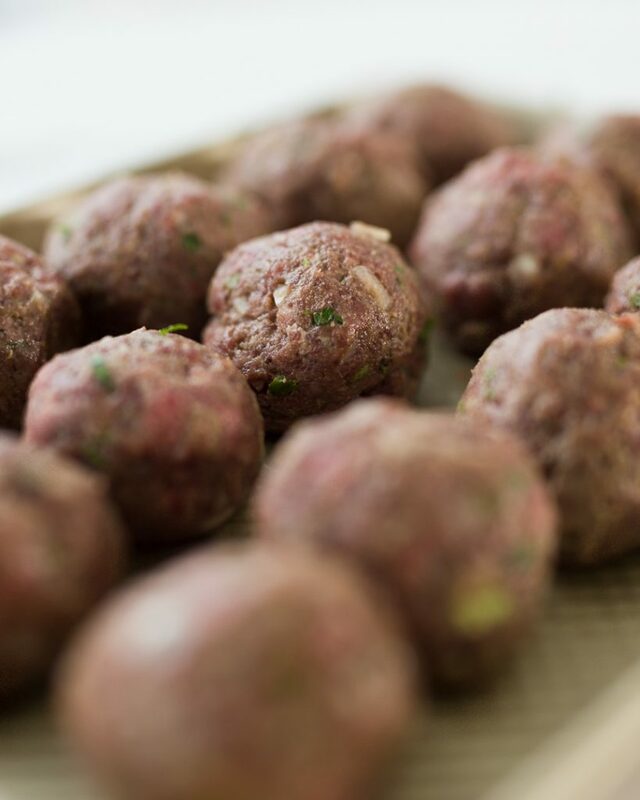 If you shape the meatballs before freezing, make sure to thaw them fully before browning. Otherwise, the outside of each meatball will likely be burnt before the centre has had a chance to cook through. The Onion Gravy can similarly be frozen for easy, make-ahead weeknight meals. For best results and convenience, freeze the meatballs and gravy in portions you know you will consume. That way you avoid thawing large batches when you may not need to. If freezing in glass, mason jars, make sure you leave ample head room to allow for expanding liquids. 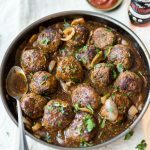 Pre-cooked Salisbury Meatballs and Onion Gravy can be reheated from frozen in a skillet covered with a lid over med-low heat. If you notice the sauce becoming too thick, simply dilute with a bit of water or beef stock if you have any on hand. To keep things Whole30, try serving the Salisbury Meatballs and Onion Gravy over a bed of cauliflower purée or mashed potatoes and with a side of steamed vegetables of choice. I went with some simple, blanched green beans because that’s what I had in the fridge, but you can serve it with a medley of steamed veg if you like. Add all ingredients to a large mixing bowl and mix with hands until combined. *Avoid overworking the meat or it will toughen. Lightly grease a ¼ cup measuring cup with avocado oil to prevent sticking. Use the measuring cup to separate mixture into equal-sized portions. 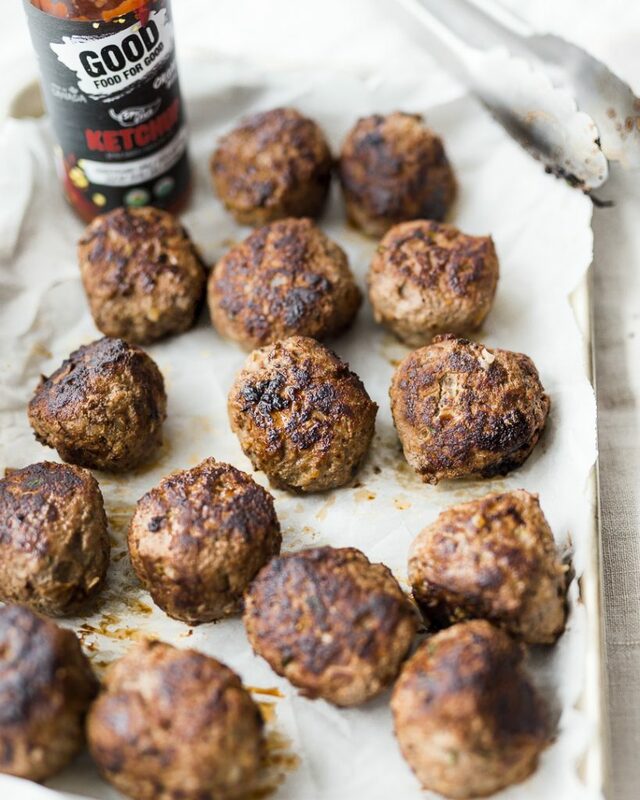 Rub your hands with a tiny bit of oil or water and roll into meatballs. 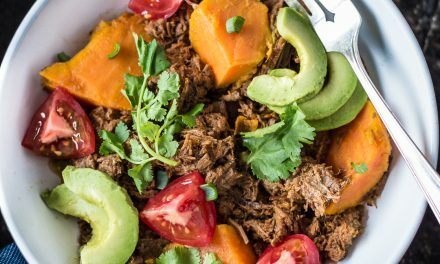 Preheat 2-3 tbsp avocado oil in a large, stainless-steel, cast-iron or nonstick skillet or sauté pan over med-high heat. Carefully add meatballs and brown in batches. Cook until golden brown and caramelized on all sides or until desired doneness is achieved (approximately 12-15min total for medium-well). For best results, avoid overcrowding the pan. Transfer cooked meatballs to a tray and set aside. Reserve 2-3 tbsp rendered fat in the pan. It’s OK if some brown bits remain on the bottom of the pan, but you should discard any black or burnt bits. Lower heat to medium, add onions and a pinch of salt and cook until slightly softened (approx. 3-4 min). Add garlic and cook an additional 60 seconds. Deglaze pan with ¼ cup beef stock. Use a wooden spoon to scrape any brown bits on the bottom of the pan. Add the remaining beef stock, ketchup, mustard, fish sauce, and stir to combine. Bring sauce to a simmer and cook until reduced in volume by half (approximately 6-8 min). In a small bowl, stir together arrowroot starch and water to make a slurry. Add to gravy and stir to combine. Taste gravy for seasoning and adjust salt and pepper as required. 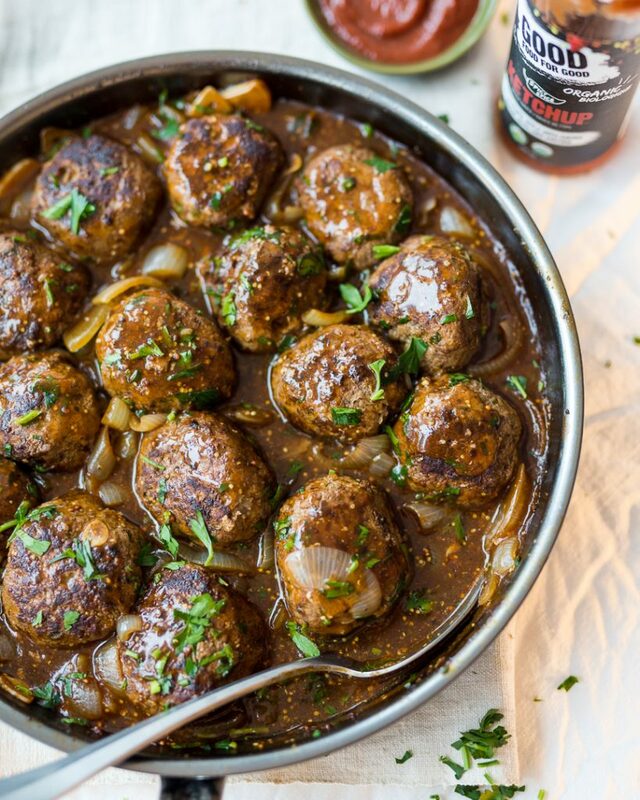 Return browned meatballs to pan along with chopped parsley and toss everything to coat. 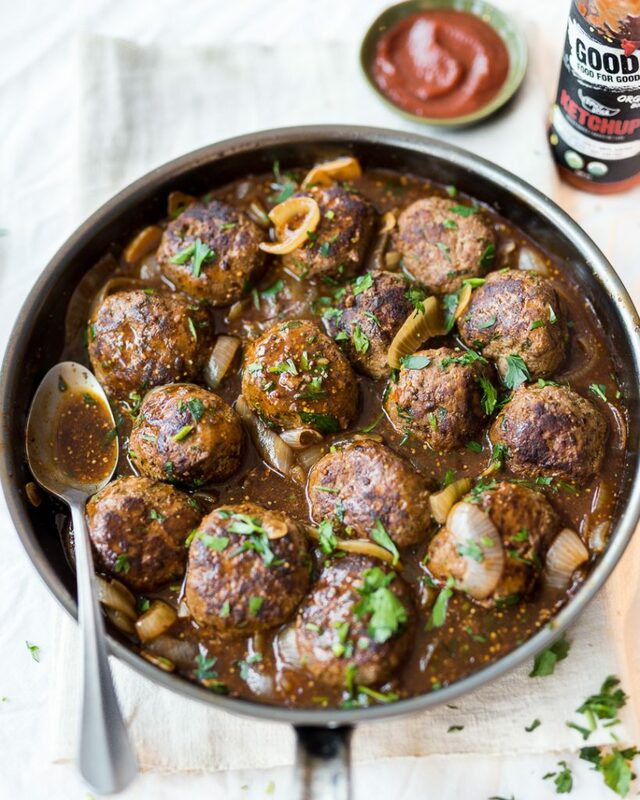 Serve Salisbury Meatballs and Onion Gravy on a bed of mashed potatoes or puréed cauliflower and a side of steamed green beans or vegetables of choice. AMAZING!!! The onion gravy is to die for and We plan to make that alone for many more dishes. This is our new go-to meatball recipe (meatballs are a favorite in our house). Still have yet to make a recipe from this blog we don’t LOVE! Thanks so much! Very happy you enjoyed the recipe!!! I made this today and unfortunately it was way too salty. Flavor of the gravy was really good. The ketchup brought an amazing taste into it. Next time, I will try half of tablespoon. I’m sorry to hear that. In my step-by-step video on my Instagram stories, I showed the step of frying a small piece of the mixture to taste for seasoning before frying the rest of the meatballs. I will include that into the recipe directions here. So good. My only challenge was the meatballs fell apart during cooking and when I took them out of the pan. Any advice? They tasted good but turned more into crumbled meat. These were so delicious!!! By far my favorite meatball recipe. My only question is the health content…how many calories, carbs, protein, etc? I had gestational diabetes with my first pregnancy so I’m really trying to be mindful of the content of what I’m eating those go around. Thank you!! I’ve been thinking about this recipe ever since I first saw it on IG and finally tried it tonight – it was absolutely delicious! 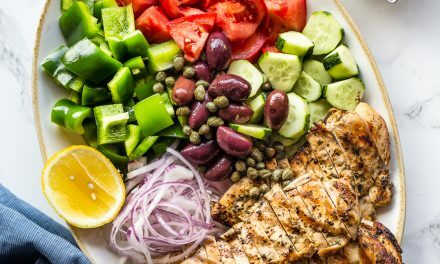 This one will go in our dinner rotation for sure. Thanks for a great meal! 🙂 So glad you enjoyed! I find that tapioca starch doesn’t work as nicely as a thickening agent but you could give it a shot. Join my mailing list to receive the latest contests, news, recipes and updates. © Copyright 2018 CookPrimalGourmet. All Rights Reserved.